A pasture of purple, blue, gold, green and red stretches to the treeline in this panorama from New Berlin, Texas. The late afternoon clouds were just about perfect for photographing Texas wildflowers, and thanks to the kindness of a land owner and an invitation to shoot inside the fence, I was able to capture unique angles of this colorful and vibrant explosion of color. This beautiful field was taken near New Berlin, Texas, in the late afternoon of a cool March evening. 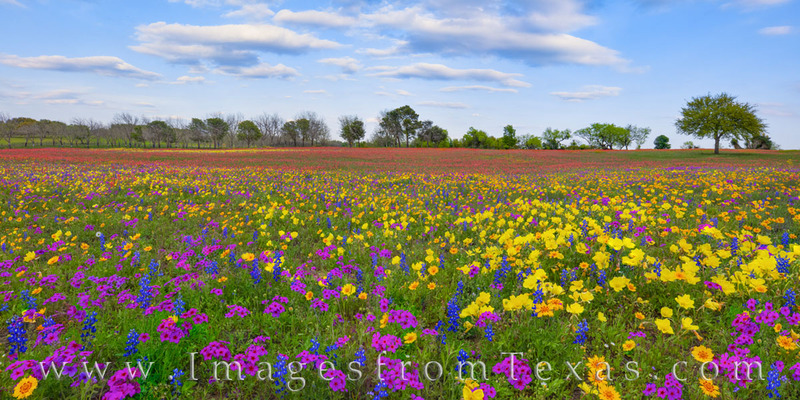 This panorama of wildflowers is available in larger and custom sizes. Thank you to the kindness of the land owner. I appreciate the invitation! Photo © copyright by Rob Greebon.